On Saturday 1st March 2014 our Coordinator, Anne Dickinson and our Chairman, Michael Woolley were delighted to receive a community award from the High Sheriff of Hampshire. As Co-ordinaor of Friends Without Borders [then HVG], Anne's work is often unseen. She offers support to all people that need the support of the charity as well as all of our volunteers. 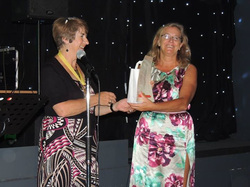 HVG was delighted to receive an award for the work of Amani Amari at the regional Wessex Charity Awards. Amani is shown here, holding her award. Amani has been a volunteer in the All Saints drop-in kitchen and as a translator for us since 2007. She got her Indefinite Leave to Remain in the UK in 2009. With the security of her new status, she then immediately volunteered to visit men in detention in Haslar. She has herself been incarcerated in her home country of Eritrea and we commend her bravery and dedication.